Now that I've caught up on posting about all my summer reads, it's time to see how I did on the summer reading bingo challenge. 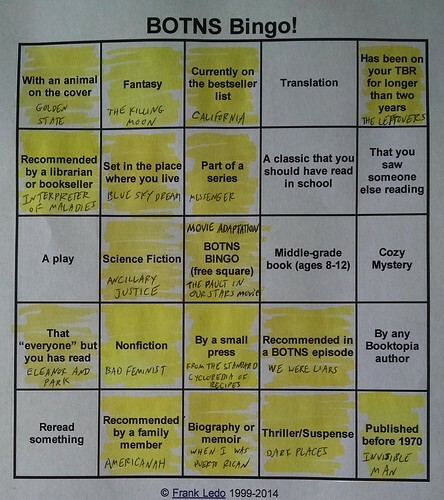 For this fun project, created by the hosts of the podcast Books on the Nightstand, I generated a bingo card with a random set of book categories, and then I organized most of my summer reading around filling in as many squares as possible. I ended up covering 17 out of 25 squares, representing 16 books and a film (the free square). Some of these were books I would have read this summer anyway. But many of the bingo squares inspired me to pick up books that I theoretically wanted to read someday but kept not getting around to. I enjoy undertaking periodic reading challenges because they provide that push to expand and mix up my reading, and I'm pleased with how this one worked out for me. Here's a look at my finished card, followed by a list of all the completed categories and books, with links to my reviews. → Andrea Blythe shares great advice on How to Dig Yourself Out of a Creative Slump: "I recently set a daily goal of writing for 10 minutes a day -- barely enough time to get a paragraph or two down. But once I finish those 10 minutes I know I've accomplished something: I put words on the page. And, more often than not, I find myself writing past the 10 minutes and putting down more words than expected."